Pakistan vs India - FINALLY! In 2004 when Pakistan and India finally decided to put aside their political differences and get on to the cricket field, there was an overdose of Pakistan vs India cricket. Tours took place every year with an abundance of test matches and ODIs. Many at the time felt that the euphoria surrounding the battle between the arch rivals was deteriorating due to the overdose. But then cricket was once again put on the back burner last year as relations between the neighbors soured. It has been over a year since Pakistan and India clashed in an international match; the last ODI being the Super 4 game of the Asia Cup in July last year. The long wait for the fans, however, is almost over! In about 8 hours Pakistan will take on India in the 6th match of the Champions Trophy, and I cannot wait for it to start. The T20 warm up match between the two sides before the start of the World Twenty20 was an indication of the buzz that is created when Pakistan and India take on each other on the cricket field. It also showed what the cricket world had been missing for so long. That was only a warm up and it arguably had a larger crowd than any of the World Twenty20 matches. Come tomorrow and Centurion will be buzzing! The world in fact will be buzzing in front of their televisions. Here in Manchester, I will watch the game with a dozen Indians; sadly there are hardly any Pakistanis in my program so it will be 1 of me and tons of them. The last time I watched a Pakistan vs India match on TV with Indians, Saeed Anwar scored 194; that has got to be a good sign. With the firepower of Sehwag and Yuvraj Singh missing from the Indian line up, they will be relying heavily on the experienced duo of Sachin Tendulkar and Rahul Dravid. Ironically, Pakistan will be depending more on their inexperienced duo of Umar Akmal and Mohammad Aamer, both of whom will be playing against India for the very first time. The pressure will test both of them. Another player expected to return to the international fold today is Mohammad Asif. That has been another long wait. Pakistan has missed Asif with the new ball for almost two years now, but against India he is expected to make his return. Hopefully one, from which he never looks back. Both the teams look very balanced so to pick a winner at this point is almost impossible. I do, however feel that Pakistan has the edge and that is not an emotional thought; they have already played a match and won it, they did well in the warm up games winning both of them, and the team seems to be eager to prove a point. India, on the other hand, lost their warm up game to New Zealand, and will take the field today for the first time in this Champions Trophy. Hence, Pakistan does have an advantage, but to take full opportunity of that, their seniors will have to come to the party. Umar Akmal cannot do all the scoring, nor can Aamer pick up all the wickets. Its a crucial game for both Pakistan and India. The team that wins is more likely to go ahead into the semi finals at the expense of the other (assuming that Australia wins all and West Indies loses all); so the pressure is going to be at its maximum. More than a year's wait, the return of Mohammad Asif, crunch game, Pakistan vs India, the Champions Trophy; it can't get bigger than that! Its been a long wait and I can't wait anymore for it to be over. Dravid already made his ' return' back to ODI's in the Compaq cup in SL. So that statement by your's is wrong. As to the match itself - it's like any Ind/Pak match. Old cliche - but the team that starts of well, would win it easily. I'm not too fussed on who wins/loses, as long as it makes sitting in front of my telly worthwhile ! 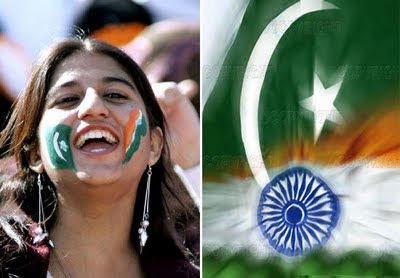 As for any indo-pak match.. they r the best battles for cricket fans I believe and this may be just another game but they play each other after over a year, hence its big! You weren't the only one who didn't care about Compaq cup. I didn't care about it earlier and before I saw the Centurion pitch, wondered on the brains of SL/NZ/Ind to play that short tournament before heading to South Africa ! I watched the game with two of my indian friends... but it was all in good spirit. Maybe a difference of opinion on some harsh no balls and Raina's decision. But in the end, we shook each others hands. Gul was disappointing today. However, it was majorly because of his noballs. He would have had an economy rate of 6 and not 9 if he was careful with his overstepping. Come on India, win the next two and lets see each other in the final.....not that my heart will be able to cope! Congrats Q, Stani and all Pakistani supporters on this memorable victory. Hats off to Malik and M.Yousuf who deserve their recognition. Their partnership made the difference for me. But we must not get carried away as there is still alot of work to be done in order to win the competition. I back our chances with every penny. Good match yesterday. Well played Pakistan. Congrats to Pakistani fans! Old is gold. Youngsters must force their way into the team like Umar Akmal did. Now about the rest of the tournament. I was just looking at the points table to figure out the best scenario for Pakistan (things like if Pakistan is first who are we likely to play against, etc). Finally, I realized that it is more important that Pakistan plays all its remaining matches at Centurion rather than worry about the opposition. In order to ensure that we must be first in our group. I don't see us beating any team at Johannesburg. Awesome match!! Esp the innings from Mohammad Yousuf & Malik! Soo happy! Fayez your message made me goto cricinfo to check out the remaining fixtures. And now it is utmost important that Pak win vs Australia. Then Pak will top the group and the semi-final will be at Centurian, and then Pakistan will have a good chance of lifting the cup as the final is also at Centurian. Nope no soccer yet.. I don't think I swing that way! Thanx Reverse Swing! Loved it! Congrats to you too man.. it was an awesome game.. was great to watch Malik and Moyo stand up to be counted! Congrats man.. the seniors showed that they still have it in them! India still stands a chance but it'll be tough.. ur missing some key players..
Old surely is gold.. Yousuf was awesome.. he didn't waste any time and though I questioned the decision to send Malik ahead of him, in the end it proved the right thing to do.. I think we have our best team, the one that played against India.. the only change I would make is Asif for Gul.. I would have said for Rana but Gul was a bit off and Rana did swing it well..
Not wishful thinking at all.. if we play the we played against India, Australia can be brushed aside easily..
Q - I totally agree with having Asif replace Gul. Gul has been out of form through all of Srilanka tour. He doesn't seem to have recovered here. Btw, a Newzealand/Pakistan semi-final and Englank/Pakistan final is possible (just like you know when). Man that Mohammad Yousuf guy can play !!! I think he is the reason Pak won although Malik went on to score the century. Very impressive. Congrats Pakistan. Thanks for good information update, its usefull information.